GOOD DAY! This is your guide, Sandara, speaking. So far, the journey into your ever-expanding consciousness has explored the reasons you stand poised at this important juncture in your reality. We are now approaching the part of this cruise that I most enjoy. As an exo-biologist, I have been schooled in the many aspects involved in transforming your present body into a fully-conscious one, or a ‘New You’. To birth this ‘New You’ involves a process that presently is integrating your Spirit (Full Self) with your physical self. A unique change in your physical body’s RNA/DNA and in its current energy centers (or chakras) is occurring. These remarkable modifications will permit you to transform yourselves from your current state of limited consciousness to a state of full consciousness. At this point you may well ask: what is full consciousness? Full consciousness is a wondrous state in which the realms of the physical and the spiritual are fully merged. You possess psychic talents such as telepathy (thought communication), telekinesis (ability to move objects through thought), and clairvoyance (ability to see into the future). Moreover, with the inherent gift to vividly see the world of Spirit, you are able to converse freely with your beloved departed ones as well as with the Spiritual Hierarchy. In short, your now latent, Christ-like abilities become fully manifested. One of the first steps in this multi-faceted process is for your local Spiritual Hierarchy to raise the frequencies of your mental, emotional, and physical bodies. This procedure increases your spiritual awareness and is one of the reasons behind the phenomenal explosion in sales of metaphysical and self-help literature and their related audio and videotapes. Likewise, a vast global movement is underway, transforming the many fields of healing and medicine. Thus, a firm foundation is being established for the entrance of a new paradigm into this present reality. Know too that this starship is endowed with the marvelous ability to shrink to a size from which we can explore in great detail the interior and the exterior of your transforming body. In this way, we can view your changing subtle (or Light Body) fields. Before we begin this journey, I wish to say a few additional words about the ongoing nature of your transformational process. With these preliminary steps underway, the Spiritual Hierarchy and we in the Galactic Federation are performing another group of fundamental operations. These procedures begin by purging much of the toxicity (negative emotional energies and experiences) that you have imperceptibly accumulated since childhood. Over the last few years, your local Spiritual Hierarchy has engaged you in an extensive series of gradual cleansings that are preparing your physical, mental, and emotional bodies for your coming transformation in consciousness. Second, another series of related procedures resets the circuitry of your brain and re-works your neurological system. These processes initiate a series of new feelings or memory patterns within you. Often, they are expressed as a sense of memory loss or a feeling of general confusion about what is going on around you. We ask you, dear Hearts, to trust and move forward in your internal processing. Bear in mind that what is occurring is a highly complicated operation designed to merge your spiritual and physical bodies. This important procedure is lightening the density of your body. Increasingly, your spiritual essence is being integrated into your physical body, causing frequent aches assorted pains, sudden fevers, bronchial, flu-like symptoms, and intense headaches. In addition, you experience periods of severe fatigue, out-of-the-blue illnesses, and problems with your sight and/or hearing. A primary reason for these difficulties is the incorporation of your multi-layered Light Body into the very core of your physical body. Your Light Body consists of fourteen layers of various subtle bodies, ranging from the etheric bodies that mirror your body’s several energy systems to conscious life energy and life information energy bodies that are connected directly to your silver and gold cords. These many systems are holistic and require certain resonance patterns to be properly attached. To do this, we connect them layer by layer to your physical body. You were born with only seven of these Light Body layers existing in your body. For you to become fully conscious, the numerous layers presently outside your physical body need to be affixed to your physical self. We have had to slowly adjust the many modifications to your physical body needed to complete this task. To do this, we have mirrored the electromagnetic activity of your Light Body with that of your physical body. We began our complex operation in the areas of your head, hands, feet, and lower torso and then painstakingly worked our way inward. Owing to the holistic nature of your Light Body and the unprepared nature of your physical body, we have had to gradually alter your physical body to accept each additional layer of Light Body. Adding to this project are the many thoughtforms that you have inherited, either from your ancestors and your parents or from what you have created during this and various other lifetimes. We have resolved all of these complexities with a series of specially applied resonance patterns, designed expressly for you and for the particular aspect that we were integrating. This procedure, most significantly, has made you face many of the fears, anxieties, and denials revolving around what is actually happening to you. Your local Spiritual Hierarchy and the Galactic Federation of Light a (including your captain and her valiant crew) are very proud of you. We are profoundly certain that you will succeed in carrying out these most amazing transformations. Before we take a closer look, please note that this integration entails the reordering of a number of your mental, emotional, subtle, and physical body fields. If you will all look out the observation lounge windows to your left, you can see that your body is made up of numerous, yet different, consciousness layers. As we pass by, observe how each layer is fluffed around your body like so many gossamer bands. Every one of these consciousness fields is being recalibrated to its highest and most appropriate harmonic. Right now, you are living in a limited conscious state in which your physical body is mostly separated from your spiritual body. Your mind and various emotions are employed as the mediators between the two. This means that your capabilities as a sentient Being have been greatly curtailed. Your physical body has also been permitted to decay. Your creative potential exists with a high probability of being sabotaged by fear, vacillation, and self-doubt. This reality is a great burden each of you must bear, literally, from cradle to grave. You live in a society in which, to a great degree, your vast power and individual sovereignty have been given away to others. We are now ready to embark on our first mini-tour of your body which will explore the rearrangement of your cellular RNA/DNA. Before our journey begins, let me give you some additional information about your RNAMNA. The unique protein strands that form you are extremely sensitive to Light. They possess a regeneration cycle that occurs while you are asleep. Originally, you had a twelve-strand RNA/DNA that provided you with a 48-pair base instead of your present 46-pair base gene structure. During the last days of Atlantis, these twelve strands were manipulated into your current two- strand RNA/DNA. The scrambled RNA/DNA materials were housed in the separated center strand, disconnected from the remaining two strands. A series of occasional catalytic interactions was substituted for its former numerous activities. Originally, many of your geneticists thought this third strand was a vestigial remnant of some primitive RNA/DNA. By the mid-1990s however, this belief had changed markedly. As you can see, there is quite a tale to be told. Our narrative begins in the early 1950s when Doctors Watson and Crick make an epic discovery concerning the RNA/DNA double helix. They find a third, separated strand in the center of the double helix. Other researchers soon confirm their findings. At first, many geneticists postulate that this third strand is just protein detritus, a material left over from the more primitive evolutionary elements that originally created the human species. Nonetheless, by the mid-1980s, doubts began to be expressed about this concept. Many genetic researchers involved in the early study of the human genome determined that the third strand was starting to connect to the four ladders inside the double helix. This activating third strand displayed highly unusual properties. Its unexpected development suddenly called into question how human evolution had occurred. Infants born with this activated third strand demonstrate very high intelligence and expanded psychic abilities, the most common of which is telepathy. Many babies are able to ‘talk’ telepathically with their parents, even warning them of potential danger. Initially, these children were rarely seen. However, since the early 1990s, more have been observed worldwide. At a special meeting in Mexico City in 1995, geneticists discussed this occurrence (now much more widespread) in secret. In addition to these amazing children, a number of adults began to appear, globally, whose third strand is in the preliminary stages of reconnecting to the four ladders of the RNA/DNA double helix. By the mid-1990s, the situation had become more prevalent. During the 1995 Conference on Genetics in Mexico City, scientists debated whether to conceal this odd problem from the public or to give out false information, pending the completion of further studies. Many geneticists saw this phenomenon as the potential beginning of a new global catastrophe. They failed to see it as a portent of the ever-evolving integration of body, mind, and Spirit. The first stage of your cellular genetic mutations consists of this third-strand phenomenon. Once this phase is completed, a second stage begins, initiating a multi-strand RNA/DNA (from three to five or even six strand) and soon causing superb unification among your mental, emotional, and physical bodies. This stage ends when your genetic material is ready to transform itself into its final form: twelve-strand RNA/DNA. DNA actually has a receptive quality. The protein itself is almost like a hologram, a fact that many geneticists (especially in the field of bioelectrical genetics) have discovered. They have found that if information is introduced into the wall of a cell, it is immediately brought within the cellular nucleus. A relationship exists between the cell wall and the nucleus that these scientists were initially at a loss to explain. Cellular interaction takes place, changing the amounts of various chemical reactions, proteins, and so on in the cellular structure and actually altering the metabolism of the body. Both chemical reactions and genetic codes are involved in this process as well as facets of the gene structures that have yet to come online. With a change in consciousness, actual chemical changes occur. Restructured genes activate processes that can alter your physical structure. Previously, I have explained that the change in consciousness occurs at a physical, emotional, mental, and spiritual level which manifests as a cellular alteration. Now you are equipped for the development of the magical RNA/DNA star tetrahedron! As we enter your RNA/DNA protein strands, carefully observe the fabulous light show. Pay attention to the energy bouncing from one strand to the other. Notice how each special rotating antenna, located where the various protein ladders connect, brings this information-energy in from other dimensions. The physical basis of your full consciousness is twelve-strand RNA/ DNA. This amazing organic Light material forms as a star tetrahedron (see FIGURE 8) that constantly spins and rotates on its six major axis points. In addition, the third strand in each of the six helices connects to (and continually weaves patterns of Light around) the central core of the star tetrahedron. Every day, your Sun transfers pure photon energy to Earth’s atmosphere. One source of these patterns of Light is the Sun. Another is the constant transmission of inter-dimensional information, which is energy. This second source of life-giving photon energy contains a great deal of data from your local Spiritual Hierarchy. Information is collected through the use of special rotating antennae found on the two strands that form the helix and located where each strand intersects with its four ladders. Here, a special series of vortices, created by the constant gyrations of the different elements in the star tetrahedron, makes this acquisition possible. 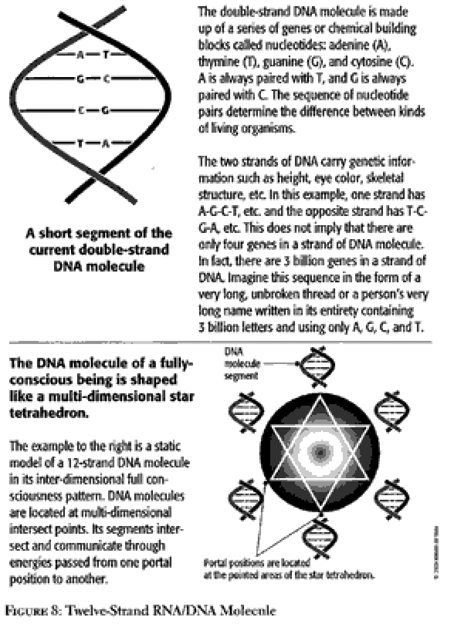 These sacred transmissions give your fully developed RNA/DNA the special codes they need to properly distribute your life force energy throughout this remarkable ever-changing star tetrahedron. In addition, these specially designed rotary antennae regulate the amount of photon energy present in each star tetrahedronan this way, your RNA/DNA receive its life-giving photon energy and then converts it into energies that your body’s consciousness can easily process. Let us take another look at how this process operates. Fully developed RNA/DNA interacts in very profound ways with your internal cellular structure. In the past two decades, your cellular biologists have discovered that consciousness changes the nature (functioning) of the cell and its relationship with other cells in your body. In this recently emerged field of ‘quantum biology’, consciousness (perception) can be observed to alter the health or even the daily interactions of cells. Full consciousness dramatically increases that same procedure. In this case, your consciousness interacts on the smallest levels of cellular biology. In effect, your body, mind, and Spirit are completely integrated -a transformation visible in the exchanges now occurring in your transmuting RNA/DNA. This amazing alteration in the state of your physicality necessitates the adoption of some new physical energy centers (or chakras) where the freshly integrated consciousness can reside. In our next mini-tour, you shall see how four new chakra centers are being added to your physical body. This currently evolving process has brought you to the very edge of creating a most extraordinary reality: ‘Your New Chakra System’. In the next stage of your physical body’s shifting reality a realm of many vibrant prismatic colors and dancing energy patterns. Your body’s chakra system can be viewed as an energy pattern of beautiful colors, circling each of its thirteen major energy centers. Imagine glorious combinations of reds, coralpinks and vibrant light-blues, red-oranges and pale and day-glow greens, dancing together in marvelous ways. Picture each energy center working with every other as one. Before we immerse ourselves in the observation of our chakras, let me briefly describe why this is happening to you. Chakras (or your major energy centers) allow your transforming physical body to integrate its spiritual body and to function properly. To accomplish these complex procedures, your local Spiritual Hierarchy intends to bring four additional chakras online as soon as possible. These four new centers will permit you to manage the immensity of multi-dimensional information inherent in your new physicality. In addition, they will transform the other seven chakras, thereby allowing them to take on many new ‘responseabilties’. Let us now engage our ship’s unique ‘miniature’ drive and enter this changing life-energy system of your chakras. Instead of the previous seven physical body centers, your transformed body now has eleven. This eleven-center network has two additional interdimensional (etheric) centers located above the head. They are called the ‘Universal Female’ and the ‘Universal Male’. In total, you will have thirteen primary or main chakras – two purely etheric and eleven that are part of your physical selves (see figure 9). Let us begin the following portion of our mini-tour by describing these new and currently transforming chakras. The tenth chakra (pineal center) is located in the center of the forehead above the nose and near the pineal gland. It brings in higher Light frequencies and is known as the vision center or the ‘third eye’. Together, the eighth and tenth chakras permit you to receive and interpret visions and other key messages from higher vibratory states. Let us now move our ship’s camera into a better position. From this new vantage point, we are able to see how the chakras operate. To begin, let us examine the way your head chakras connect to your now forming twelfth and thirteenth chakras. If you visualize the area around your head, you can see an energy triangle forming. Emanating from it are many vibrant, prismatic colors and energy information packets perceived as sudden blips of Light. This triangle connects the twelfth (Universal Female), thirteenth (Universal Male) and eleventh (crown) chakras. Yet another line travels from the eleventh (crown), to the eighth (Well of Dreams), to the ninth (pituitary), to the tenth (pineal) and, finally, returns, back up to the eleventh (crown) chakra. Visualize two flat circular shapes that connect through the eleventh (crown) chakra to create a special rotating, scalar wave transducer. Scalar waves are inter-dimensional waveforms. The rotating, triangular head antenna allows a person to radiate her/his life and information-energy to others. Through this same device, the individual receives the energies of others. Both upper and lower brain centers are thereby able to inter-communicate in ways that are beyond your present capabilities. In effect, Earth humans will have a first (or ‘outer’) sight and a complete second (or ‘inner’) sight. Psychic abilities such as telepathy, telekinesis, clairvoyance, clairaudience, and psychometry will become natural. At this point, we will zoom our camera focus out just a bit. From this macro perspective, we can clearly see how these centres interact. The eleventh (crown) chakra brings in Light (life and information energy) and channels it to the eighth (Well of Dreams) and sixth (thymus) chakras. As we have just seen, the eighth and sixth centers (both Light sensitive) interact. Remember that Life originates within the divine Light of the Creator. Focused in this way, many of the frequencies of divine Light produce a Love harmonic. The energy this focus produces causes the eighth and the sixth centres to resonate with the fifth (heart) centre. As the eighth, sixth, and fifth centers resonate with each other, they radiate energies that allow the seventh (throat) center to receive the incoming prana. (life energies). These harmonies (songs of Light) move down, to the ‘prana’ or fourth (diaphragm) center, distributing the prana energy and invigorating and cleansing all the cells of the body. Let us now zoom in closer with our ship’s camera to allow you to observe your expanded, fully-integrated chakra system in operation. Notice that each centre is vibrantly multi-colored with no shade predominating. Depending on its health and function, each centre’s colors encompass almost the full spectrum. Light energies emanating from each centre appear as constant fire flashes from a very bright Light. They are continually exchanging energies and information. This process creates a natural and self-regulating feedback or information loop which makes the many energy systems of your body appear to spin and pulse simultaneously like a ‘lighted’ toy top. As the chakras of your body’s system glimmer, their Light resonates a glorious musical harmony. They create an effect similar to a computer-linked synthesizer which can convert a sequence of colors into a musical composition. Heard more closely, the sounds of your body resemble a mixed choir performing an exquisite, classical oratorio. At times, your body echoes a magnificent, angelic chorus. Although these frequencies are currently too high for your ears to perceive, this is the way in which your body sings its intentions and constant praises to its Angelic guardian councils, body councils, and fellow Light Beings! Using our ship’s camera, let us now ‘zoom’ in, yet again, on this multi-colored, shimmering body. First, observe the solar plexus, the area of your belly button and abdomen, which connects you with your silver cord. This cord brings in the Universal Creator energy from your divine source (the realm of the Creator) to your physical instrument. In a very special manner, it then distributes this energy throughout your physical body. 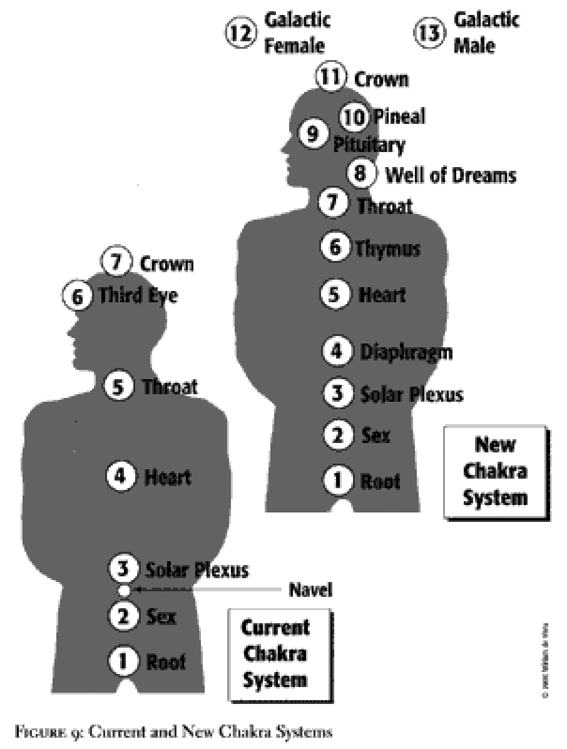 The key to this process involves the relationship between the third (solar plexus) and sixth (thymus) chakras. Observe a special loop (or ‘bow’ of silvery-white energy) passing between them. Special life energy enters the back of the shoulders at about the level of the upper chest. The sixth chakra is the body’s special, energy-receiving center. The thymus, a center of high wellness and immunity, absorbs the energy, and finally the life energy intermingles with the energy of Creation -the Universal Creator energies. The energy of Universal Creation flows in through the silver cord and the third chakra. Notice how this pulsating ‘bow’ of silvery-white and other intertwined colors rains down in a shower of sparkles on your diaphragm. This happens because your fourth (diaphragm) centre – your prana center – transmutes the energies into a more usable form and then distributes them to every cell in your body. The diaphragm center also utilizes the energies to transform many negative or limiting thoughtforms. As we adjust our camera again, you can, without doubt, distinguish what is occurring with your body’s energy systems. Information-energy descends from the eleventh to the third chakras while life energy ascends from the first to the third. At the third chakra, the two energies meet and interconnect, then move back up to the eleventh chakra, completing the circuit. Thus, they link the energies of the lower chakras to those of the higher chakras. Look closely at this massive exchange of multi-colored and highly vibrant energies. What an incredible kaleidoscope of colors, flashes, and melodies comprise the “New You’! However, your view of yourself is not yet complete. Myriad wonders remain for you to see! As we re-examine the Light show going on in your heads, we observe that these amazing energies move first through the twelfth and thirteenth chakras (the Universal Female and the Universal Male, respectively). In this way, the body maintains its femaleness (left side) and its maleness (right side). The body’s nervous, circulation, and consciousness systems all mirror the dual female/male energies. If we examine this entity holistically, we can discover how incredible it really is. As we have duly observed, the new, fully-conscious human Being is able to rejuvenate, is tapped into the inter-dimensional world, and can see spiritual energies. This Being is one with what you call the realm of the dead (the Spirit world) and is capable of producing powerful thoughtforms. Such a Being seeks Love and desires to discover/ascertain what reality is made of and how to plumb the depths of its soul’s purpose. This Being is curious about its past and future lives and reaches out for any information that can assist it in its search. In short, this desire creates among all existing physical Beings the basis for a new collective contract, leading to the construction of an entirely new reality. In this new reality, an expanded consciousness field is formed. it is the means for your planetary society to understand itself more profoundly than is presently possible. Streaming in and around you is the consciousness of others -their thoughtforms, wishes and prayers, their upsets, anxieties, and more. The first prerequisite is to teach you how to regulate these new energies and show you how to be in oneness and harmony with this new consciousness. You need to be taught the etiquette of mutual interaction. Then, you can finally begin to understand the processes that surround you so that you will be able to mutate into a true planetary guardian or physical Angel. Once you learn to mentally adapt to your new consciousness, it becomes necessary for you to understand how to control and use thoughtforms, how to communicate properly with those who have passed on, and how to use the knowledge of Spirit to aid yourself and others. Counselors from the Galactic Federation of Light can teach this to you. As the educational process continues, Mother Earth knows how to discover the ways in which her humans forever manifest their reality. That process leads your reality into ever-interlocked and unified fields of consciousness. Each of you is a human Light point, interacting with all others, to produce a global web of focused consciousness. This is a very special communication web capable of making almost anything in this world possible. To reiterate: you are a guardian or physical Angel. Bear in mind that you are a corporal and, more than that, a spiritual Being. Therefore, it is imperative that you need to be prepared for the great change that is about to occur. Realize that, as a result of your growth in consciousness, a new reality is about to dawn for all humans on this blessed orb! Let us review a few of the exciting things we have discovered during our two mini-tours. Some of your transformations are due to the expansion of your consciousness. You possess a Light Body, thoughtforms, and the ability to overcome age, to rejuvenate. You have the ability to communicate telepathically with others, with plants and animals, and with the Gaia (Earth) force itself. Also, you are able to communicate with those who have died and with those who might, today, be called Angels or nature Devas. You may ask why your local Spiritual Hierarchy is suddenly integrating your physical and spiritual bodies. For what reason are they at this moment instituting four new chakras and creating a twelve-strand RNA/ DNA? Simply put, the reason for all of this is that Mother Earth has decided to change herself most profoundly. The Spiritual Hierarchies, all the way up to the Creator, have given her full permission to transform and transmute into her pristine and fully-conscious self. Imagine being in a room in which the walls, the floors, and even the ceilings suddenly became electrified. It would be very difficult for you to continue to exist in that room unless you changed as well. That is why you need to become a fully-conscious Being. 3) You change your energy systems entirely. In this way, your physical systems actually integrate your multi-dimensionality as well as your physical, mental, emotional, and spiritual bodies. Let us now permit some questions, the answers to which can help you better understand these momentous changes which are creating the ‘New You’. Q: How will people already in adult bodies be affected by these changes? A: Right now, the Spiritual Hierarchy is involved in the process of preparing everyone for this change. For example, many people are already beginning to feel a separation occurring in the heart chakra. The upper heart is becoming the thymus center, while the lower heart is becoming a true heart center more focused on Love energies. This is the reason that more and more people are beginning to feel some very deep emotions as the heart is the ’emotion center’ of the body. The diaphragm center is also being set into place right now. Q: How is this process affecting our brains and memory patterns? A: To prepare you for the new, rotating energy patterns that the fullyconscious brain can pick up, preliminary shifts of circuitry are occurring in the brain. People are experiencing tremendous changes in their memory patterns -short-term memory loss, the sudden reappearance of longforgotten memories, and/or unusually vivid dreams. Most of you are undergoing a process of memory recovery. As a result of both short-term memory loss and memory recovery, your brains are being prepared to become fully conscious. More and more, scientists are discovering the brain’s holographic capabilities. Q: What will the complete prototype of the emerging holographic brain and head look like, and when will we see the changes? A: Modifications usually take about one generation to manifest. There is little difference in appearance between the person who is born that way and the person who is now being altered. The results are the same. Once you attain full consciousness, the reproductive phases of your existence will utilize your new twelve-strand genes. As a result, like most people born in fully-conscious human civilizations, the babies do look a little different from you. They tend to be a bit taller with larger heads and lovely big eyes. Also, their ears are slightly bigger and placed higher up on the head. Q: I have one other question about body changes. You talk about the thymus gland revivifying over the course of a couple of generations. What happens to the thymuses of those who are currently adults? A: They will become a lot larger. Currently, the slowdown and deterioration of the thymus is a major cause of the aging process in the conscious body. When your thymus function is re- established, you will hardly age at all. Your thymus deteriorated because of the increase in background radiation caused when the two firmaments collapsed. Once you return to your fully-conscious body, the thymus’ true function can be completely restored. Your thymus can actually enlarge to almost one-third the size of the heart. Once this happens, you have an organ in your body that maintains and anchors your entire immune system. This also permits you to actually control the aging process, because you can use the restored thymus to rejuvenate yourselves. Q: What is a scalar wave, and what is the significance of the new head chakras forming a scalar wave antenna? A: A scalar wave is the result of inter-dimensional electromagnetic wave propagation and operates in multi-dimensional space/time. 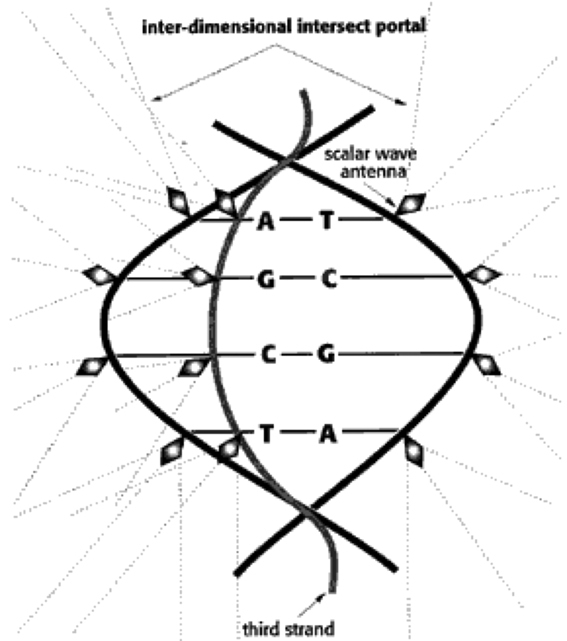 A scalar wave tends to propagate as a transverse wave or a standing wave. Hence, it is a very unique wave pattern and requires a very special type of antenna to pick it up. When your consciousness shifts, you are able to pick up these fields through your own frequency shifts and the inter-dimensional capabilities around your auric field. Next, you need to process these novel types of inter-dimensional information. Once the limited conscious genetic plug is pulled, certain RNA/DNA structures can then take in this information and allow your brain cells to directly process it from inter-dimensional sources. You are able to process data on your own spiritual and mind-energy levels as well as on cellular or body levels. This new capability allows you to interact, immediately, directly and inter- dimensionally, with what is going on in your reality. Q: Is this part of becoming reconnected to the larger reality? A: Yes. That is exactly true. You are becoming able to experience the full reality, the true ‘Now’, that all of the great mystics have been speaking about. The true ‘Now’, which is of the inter-dimensional galaxy and of the universe, will be your ‘Now’. Q: How does RNA/DNA mediate this process? A: Alterations and advanced concepts of genetics, the kinds of things discussed by many well- known people in alternative medicine, have been discovered. Drug companies doing genetic research and major universities allied with them, as well as the National Institutes of Health, are bringing similar processes to light all the time. This situation means simply that you are in a process of tremendous change. Consequently, you need to understand that your cellular structures affect the body and the mind just as the mind’s thoughfforms affect the cellular structure of the body. Currently, on the physical level, we are being prepared to receive these momentous changes. Although we already contain the RNA/DNA, it is now latent or in much less than full operation. It is being recreated so we can function on ‘all four burners’ instead of on just one or two. As these changes occur, will we be able to come ‘online’ with grace and ease? A: Yes. This is why the therapeutic work of various well-known practitioners of Vedic (traditional, from India) medicine is so important. They are instructing their western readers about the true, healing value of this ancient medicine’s approach to the connectivity of all forms of life. Their information dovetails nicely with the flood of biological statistics now pouring in from public and private bodies such as the World Health Organization. These statistics show that the very air that we breathe, our RNA/ DNA protein strings, and even the materials that make up our cells, are all constantly being exchanged among all earthly life forms. By combining these two important fields of knowledge (medical statistics and Vedic medicine), an explanation of the ways in which consciousness on this planet exists in mutual relationship to physical beingness is provided. Life here is totally interrelated. For all practical purposes, you are unequivocally one interconnected, living organism! Eventually, you will start to realize that there is a physical basis for consciousness, and you will understand fully that you are ever so much more than just a physical body. Q: How does this idea relate to what is now occurring in our physical bodies? A: The physical body has its own way of doing things. For example, many of your scientists have discovered that the cellular wall and the cell’s nucleus are of equal importance in determining the dynamics of the cell. The nucleus and the cell wall are now considered almost as one. Your researchers are discovering that cellular dynamics have more far-reaching effects than traditional biology has led most people to believe. There has been a tremendous explosion in the understanding of the nature of what life is really all about. Your researchers are now conducting experiments demonstrating that Life is a form of inter-dimensional Light. You are beginning to learn the ways in which this Light influences cellular structure -to a greater degree than anyone ever thought possible. Q: Is this knowledge leading to a new biology? A: Yes, presently. You are beginning to see how physical cellular structure is created and how Light and magnetism create, maintain, and alter the actual metabolism and life history of the cell. From around the planet, you are acquiring actual documentation illustrating how genetics are being altered. You are also seeing how genetics affect consciousness and how consciousness affects genetics. You are developing a form of quantum biology. Q: You have stated that our physical body is actually pure thought. Will you please explain? A: Of course! The physical body is well over go per cent pure space. The rest is resonating Light patterned by your thoughtforms. These individual and collective, mental and emotional constructs create your 3-D reality right down to the minutest details. Parts of these thoughtforms are hereditary (passed down from your very first ancestors to you). The rest are from your childhood and adult life. These constructs have combined to create the physical body you now have. Q: Can I change my form and the color, length, and thickness of my hair? A: The answer to this particular question is ‘yes’. When you are fully conscious, you are in complete control of your physical body. What you can do then is something that may appear to you now as magic. However, in your new reality, it is no more than the realization of your true desires. Bear in mind that what you think is what you are. Q: What about the people who just sit back and watch the evening news, or some sitcom, or whatever. Are they getting the necessary information? A: Yes. A lot of them are getting it. The popularity of many authors and cinematographers is a result of their success in explaining the position of Vedic and complementary medicine in these matters. There is a lot going on out there. In effect, you have attained a threshold of consciousness. Once you reach a certain level, you begin to search. That is why books in these areas are suddenly on the “bestseller’ list. Like a person with a voracious appetite or a deep thirst, as your process evolves, you investigate these fields more and more. Q: Is it like Close Encounters of the Third Kind where people were impelled to go to the ‘Tower’, haunted by an image that they were at a loss to explain? They just ‘knew’ that they had to search until they found out what it was they were looking for. Q: And it is an inner excitement that is stirring people up! Do we know what we are looking for, or is there only a deep yearning inside? A: You feel a powerful, inner drive which is a crucial part of this process of change. As your intuition grows, you begin to recognize feelings that come from within. This is the ‘re-source-ful’ energy of the heart. It is what this ‘new’ reality you are currently creating is all about. A fully-conscious civilization is based completely on Love (heart energy). It is founded on a thoughtfulness for oneself as well as for all others, resulting in exquisite balance, naturally experienced by all. Concurrently, a genetic shift is also changing your consciousness. It is the reason for an increased interest in Angels and people ‘becoming’ more psychic and mystical. Across this planet, there exists a burgeoning, messianic-like fervor. The first stage is expressed by religious revival activity, and you will move beyond it. The tremendous growth in your awareness of Spirit, which you are experiencing, is happening in each and every culture around the planet. This feature (the return to your original, spiritual roots) is part of the program. People are seeing its importance right now. Indigenous peoples are also spreading their knowledge. Spirit guides have directed shamans and sacred members of tribal nations to disseminate this vital knowledge NOW! Q: Regardless of whoever people thought they were, they are now waking up to who they are. Can our space kin take us by the hand and guide us toward our full heritage? A Yes. Very soon, your space kin will appear and confirm this information. Then, together, we will bring to fruition the civilization you were always meant to create – that, in fact, you have already begun! We, in the Galactic Federation of Light, are very proud of your accomplishments. Soon, you will stand beside us as equals. You will have completed your miraculous transformation into fully-conscious Beings, living in a galactic society! this is indeed a landmark article. thank you for writing with such depth and clarity. I have shared this extensively on my FB page and will continue to use it as primary research material. you lend much-needed clarity to the state of our communal ascension. folx who are particularly ready to transform will resonate strongly with your exacting words.